A next-generation UltraGPR instrument is being developed with higher stacking using 400 MHz ADC chips and a more powerful transmitter. 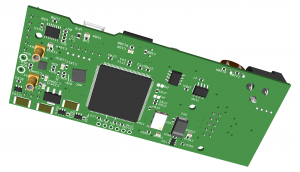 In addition, the receiver will now contain ancillary sensors, such as a 9 degrees of freedom accelerometer, its own GPS, magnetometer, temperature and moisture sensors, and a vibration sensor, along with its own on-board datalogging capabilities on MicroSD cards. In addition, users will now be able to specify other time windows, along with time sample spacing. Of course, the new receiver will feature real-time sampling as did previous versions of UltraGPR. Groundtruth Exploration in Canada’s Yukon continues to employ UltraGPR technology for alluvial gold exploration. To date, over a dozen sites have been investigated using the method to map the position and depth of paleochannels in extremely remote locations. Although clay is present at some locations, over penetration has not been an issue, averaging over 20 m.